Re-issued on vinyl for the first time since its original 1967 release! 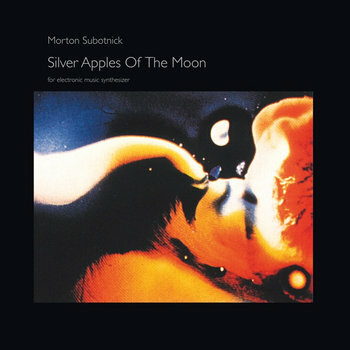 MORTON SUBOTNICK’s truly visionary electronic master piece “Silver Apples Of The Moon” on an audiophile 180gr LP, especially mastered for vinyl. As composer, musician and initiator of the San Francisco Tape Music Center which he co-founded with PAULINE OLIVEROS and RAMON SENDER in 1961, MORTON SUBOTNICK (born 1933) has propelled the progress of electronic music in several significant ways. From 1963 on he worked with DON BUCHLA on the development of the early synthesizer “Buchla Series 100” before moving to New York where the artist-in-residence at the newly established Tisch School Of The Arts of the New York University was enabled to set up his own studio. That’s where SUBOTNICK’s most popular work “Silver Apples Of The Moon” was commissioned by NONESUCH as the first electronic composition ever that was especially conceived for a vinyl release (in opposition to the common practice of performing live). Till the current day this seminal album has not lost his visionary power, has since long been considered one of the essential milestones in electronic music with great effect on later generations of artists – starting from the cult formation SILVER APPLES to LAIKA who titled their debut “Silver Apples Of The Moon” too. Now for the first time since its original 1967 release, SUBOTNICK’s masterpiece (which was selected for the Library Of Congress in 2009) has finally been made available on vinyl at last: a new audiophile 180gm LP that was cautiosly remastered for vinyl.